Therefore, knowledge alone is not in itself the primary objective. The primary objective is the obedience of Allah and his Messengers (i.e. acting as the knowledge states). This entry was posted in B. Praise worthy morals, D. Acts of Worship, H. Whispering & random thoughts, J. Rights , L. Books, N. Advice, Q. Akabir, T. Tarbiyet on April 20, 2019 by 'abd. A student asks regarding the lack of experiencing ḥalāwat (sweetness) when reciting the Qurʾān. Sayyidi wa sanadi Mufti Mohammed Taqi Usmani (Allah preserve & protect him) advises to continue with the recitation, as experiencing sweetness is in itself not an objective, the objective is to please Allah Almighty. If sweetness is experienced then it is welcome, otherwise, it should not deter a person from continuing to recite. This entry was posted in D. Acts of Worship, E. States, F. Zikir & fikr, H. Whispering & random thoughts, J. Rights , N. Advice, T. Tarbiyet, W. Wird & wazaif, Z. Mustahebbat on April 19, 2019 by 'abd. He should have faith (I’tiqaad) in him i.e. he should have love and respect for him and accept him to be a pious, rightly guided person who follows the sunnah. He should have trust (I’timaad) in him i.e. he should have confidence in the guidance and knowledge he imparts and regard him capable of guiding him correctly in Deeni matters. He should submit (Inqiyaad) to him i.e. he should follow the advices and teachings of the Shaykh diligently with complete commitment and dedication. This entry was posted in A. Reality of Tasawwuf, B. Praise worthy morals, H. Whispering & random thoughts, J. Rights , N. Advice, Q. Akabir, S. Sunna, T. Tarbiyet, Z. Mustahebbat on April 13, 2019 by 'abd. ‘Neither have conviction about, nor associate with a person who appears to be a Sufi but contravenes Sharia (laws). This is irrespective of his having unveiling (kashaf) or miraculous incidents (karamat). This entry was posted in A. Reality of Tasawwuf, H. Whispering & random thoughts, J. Rights , N. Advice, T. Tarbiyet on February 23, 2019 by 'abd. 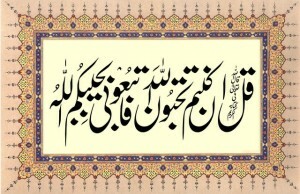 ‘If Satan creates a doubt in any of the beliefs (aqaid) recite لا حول ولا قوہ الا باللہ and push it away. Do not pursue it excessively. This entry was posted in E. States, H. Whispering & random thoughts, N. Advice, T. Tarbiyet on February 16, 2019 by 'abd. This entry was posted in J. Rights , N. Advice, Q. Akabir, T. Tarbiyet on February 13, 2019 by 'abd. 3. Completion of repentance. That is, compensating (qaza) the lapsed essential (fardh) and recommendable (wajibaat). It is essential to follow this order. Haphazard activities usually results in waste of time and effort. May Allah facilitate it for all of us. Ameen! This entry was posted in A. Reality of Tasawwuf, D. Acts of Worship, F. Zikir & fikr, H. Whispering & random thoughts, J. Rights , K. Fiqh, N. Advice, S. Sunna, T. Tarbiyet, W. Wird & wazaif, Z. Mustahebbat on February 9, 2019 by 'abd. A seeker inquired regarding the criteria for ascertaining what speech is useless. ‘This is an issue that requires mental reasoning (ijtihad). Access mentally that if I do not say this thing is it going to harm me or another in religious or worldly matters to any extent (tiny or big). If it is then say it. Otherwise don’t. This entry was posted in C. Blame worthy Morals, J. Rights , N. Advice, T. Tarbiyet on January 15, 2019 by 'abd. Sayyidi wa sanadi Mufti Mohammed Taqi Usmani (Allah preserve & protect him) inquired from one of his mojaz regarding the weekly majalis (gatherings of mutual reminding). This entry was posted in C. Blame worthy Morals, H. Whispering & random thoughts, J. Rights , N. Advice, T. Tarbiyet on January 10, 2019 by 'abd. A seeker requested further elaboration of the Allah’s fazal mentioned in the previous post. This entry was posted in A. Reality of Tasawwuf, B. Praise worthy morals, D. Acts of Worship, H. Whispering & random thoughts, Q. Akabir, T. Tarbiyet on January 10, 2019 by 'abd. ‘Dear brother, keep up with your daily (good) activities irrespective of feeling any spiritual results or affects. These activities themselves are the goal. Here exhaustion from tiredness is the destination itself). This entry was posted in A. Reality of Tasawwuf, E. States, F. Zikir & fikr, H. Whispering & random thoughts, J. Rights , N. Advice, T. Tarbiyet, W. Wird & wazaif, Z. Mustahebbat on January 8, 2019 by 'abd. There is always a big pile of islahi letters. I reply to all, however, it may be delayed sometimes. Prior to this travel I cleared all the back log. But next day there was a another collection piling up. I don’t accept new request for islahi relationship anymore. I look forward to the islahi letters from my close friends (Shaikh always uses this term for murideen and those who have islahi relationship with him). This entry was posted in A. Reality of Tasawwuf, T. Tarbiyet on January 8, 2019 by 'abd. The beginning of sin is the (random) evil notion (خاطر). If its owner does not obviate it by disliking it, it will become (a persistent) resistance. If its owner does not obviate it by resisting it, it becomes whispering. This entry was posted in C. Blame worthy Morals, H. Whispering & random thoughts, J. Rights , N. Advice, T. Tarbiyet on December 9, 2018 by 'abd. One fortunate day, I was blessed with the opportunity to accompany Shaykh Mufti Muhammad Taqi Usmani on a Nikah ceremony that was to be conducted in a vicinity near Darul’Uloom Karachi (1). To obtain his permission for accompanying him, I was waiting for him outside his residence. His car was parked at his doorstep and in its direction, his driver had opened a car door in anticipation of his arrival. When he stepped out of of his home, l quickly moved towards him to seek his permission. As soon as he saw me approaching towards the car, he moved around the car while leaving the opened door for me. Seeing this, I was absolutely dumbfounded and I tried to gather my confidence to utter ‘Hazrat can I accompany you?’. He plainly replied ‘Yes, sure!’, while indicating towards the opened door. While I was still gazing at him in amazement, he casually opened the door on his side and got in to the car. Feeling immensely humbled, I too followed the suit by using the door that had originally been opened for him. Thus I sat with the Shaykh on the back seat of the car (Alhamdulillāh for such a privilege). I had planned to consult him regarding a personal matter in brief but I thought to wait for him to settle well in the car before beginning to talk. Meanwhile, I was hoping that my amazement and excitement will also settle, allowing me to start the talk. However, I noticed that as soon as the Shaykh entered the car, he didn’t let a minute of his to go in vain. He quickly started reading out some Du’aas (for protection) from a booklet. Immediately afterwards, he took out his smart phone and started reciting Qur’an on it! Since my matter wasn’t urgent, I thought to wait for him to get free. When we reached the Masjid, where the Nikah was to be held, the Shaykh was welcomed by a crowd (which appeared large in that congested locality). He led the ‘Asr Salāh which was followed by the Nikāh. Thereafter, the same crowd accompanied him towards the car. In a zigzag fashion, I too navigated my way through the crowd to reach the car, eager to find the Shaykh available to talk this time. Interestingly, but no longer surprisingly, he resumed his recitation as soon as he reentered the car. It was when we entered Darul’Uloom again (and thus were about to reach Shaykh’s residence in a minute), the Shaykh finally kept his cell phone back in his pocket. Fearing that he might engage in another form of Zikr (remembrance of Allah), I took a quick breath, gathered my strength and and spoke up to put forth my query to him, while gasping between my broken words. He listened patiently and then replied to me in a polite and satisfactory manner. Alhamdulillāh, thus I was able to experience a brief, yet an immensely lesson full, meeting with Shaykh Mufti Taqi Usmani (may Allah Ta’ālā preserve him and allow us to benefit from him). Dr Sayyid Talhah is a mujaz e baiyet of Hazrat Syed Ishrat Jameel Meer sahib (Allah have mercy on him). Now he has islahi ta’luq with sayyidi wa sanadi Mufti Taqi Usmani (Allah preserve & protect him). This entry was posted in D. Acts of Worship, F. Zikir & fikr, J. Rights , N. Advice, Q. Akabir, S. Sunna, T. Tarbiyet, W. Wird & wazaif, Z. Mustahebbat on December 5, 2018 by 'abd. The purpose of self-reformation is to acquire the pleasure of Allah. In order for one to gain self-reformation, one requires two things; knowledge of the path and correct application of this knowledge. Self-reformation will be obtained through one adhering to the laws of Shariah in accordance to the Sunnah, regardless of whether the laws pertain to our external actions or internal. In acquiring self-reformation, there are two things that will assist one greatly; remaining in zikr at all times, and remaining in the company of the pious servants of Allah as much as one is able to. If it is difficult for one to remain in the company of the pious all the time, then the substitute is for one to study the lives of our pious predecessors and their advices. One should refrain from two things as they are the cause of impeding one’s progress; falling into sins and becoming involved in futile activities. Together with the above, one will only be able to derive full benefit if one regularly reports his condition to his spiritual guide and sheikh (person under whose supervision he is carrying out his self-reformation). After adopting the necessary procedures in self-reformation, each person will progress and receive blessings from Allah in accordance to his capacity and the level of commitment and dedication he shows. This is the essence of the path of self-reformation. This entry was posted in A. Reality of Tasawwuf, B. Praise worthy morals, C. Blame worthy Morals, D. Acts of Worship, F. Zikir & fikr, J. Rights , S. Sunna, T. Tarbiyet, W. Wird & wazaif, Z. Mustahebbat on November 29, 2018 by 'abd.